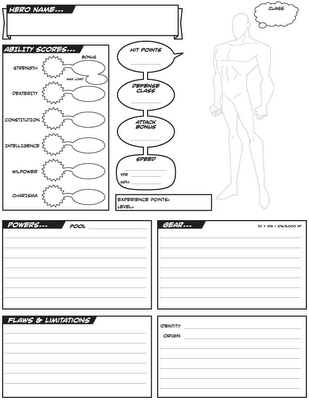 There is much to be had at Anthony Lewis’ RPG Stuff-o-Rama, including character sheets and a random powers chart. It is still in layout with Fat Goblin – I don't have a definite date of release. Hey there! I just wanted to let you know again how much I enjoy this game. I took a few minutes today to create a low-level villain for my setting and posted it on my G+ Page. I thought you may enjoy a gander… There will most certainly be more coming soon. Check my new blog post – I discuss the revision MM! is getting and preview the possible cover. Seriously – the art should be finished soon – only a couple more pieces to go.